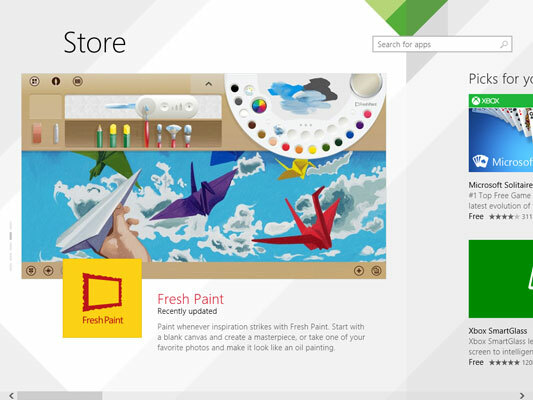 When you’re ready to venture into the Windows Store for tiled apps, tap or click the Store tile. The Windows Store is the only place you can get programs that will run on the tiled Metro side of Windows. You need a Microsoft account to get anywhere beyond basic searching. If you logged on to Windows with a local account, the Microsoft account requirement splats you right in the face. 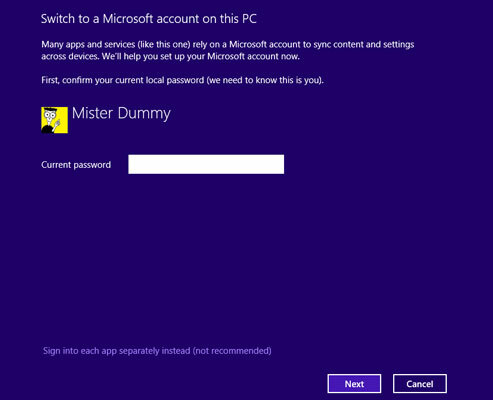 If you decide to use a local account but need to sign in with a Microsoft account to get updates or new apps from the Windows Store, set up a bogus Microsoft account and use the facility offered to sign in to each app separately. That way, you’ll be warned before you venture into another location that requires a Microsoft account. To order an app, tap or click the app’s tile. The Store takes you directly to the ordering screen for the app. 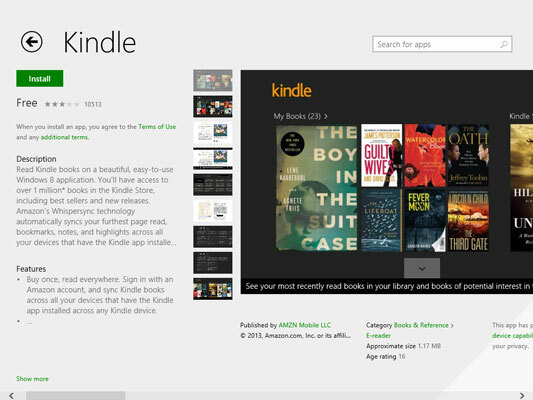 For example, if you tap or click the tile for the Kindle app, you see the ordering page. On the left, you see an overview of the app and you can get a more detailed feature list by clicking or tapping on the Show More link. Slide to the right, and you see the Ratings and Reviews. Even farther to the right, and you should see a release history (except for Microsoft’s own Metro apps, of course), list of permissions required, languages, and links to the manufacturer’s site. The star rating shouldn’t impress you — it’s the accumulated wisdom of all the people who’ve bothered to rate the app. But the supported languages section, if there is one, may be of interest — and the permissions list is detailed and thorough. At the very least, you can vent your spleen on the Reviews page if the app doesn’t live up to your expectations. To view apps by group, from the main Store screen, scroll to the right. You see Picks for You (there’s a reason why Bing collects all that data, eh? 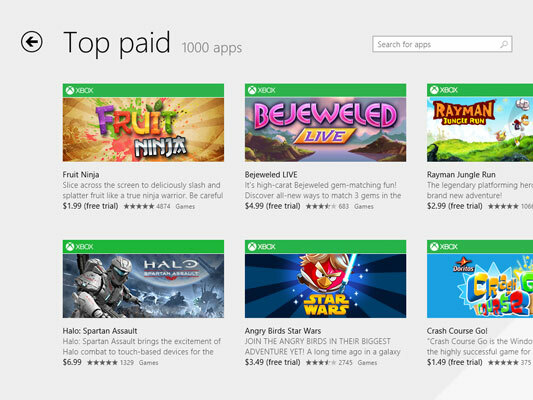 ), Popular Now, New Releases, Top Paid, and Top Free. For example, if you scroll to the right, and then tap or click Top Paid, you see the mass shown.